In my many years as a student, I managed to develop a unique skill in the art of procrastination. Therefore I feel that this knowledge should be presented formally. I would like to make it clear that although Procrastination is unhealthy and counter-productive, it is nevertheless an art form, and a truly unique one at that. Without procrastination, mankind may never have stopped to enjoy the subtle beauty and nature of life and the world around us. Sure, we all know the benefits of hard work, but we must also acknowledge hard work’s retarded arch nemesis. Now, you might be thinking, why glorify procrastination? Well, let me answer that with another question: Can you think of a time when cleaning up your room or watching reruns of your favourite TV show was ever so enjoyable? 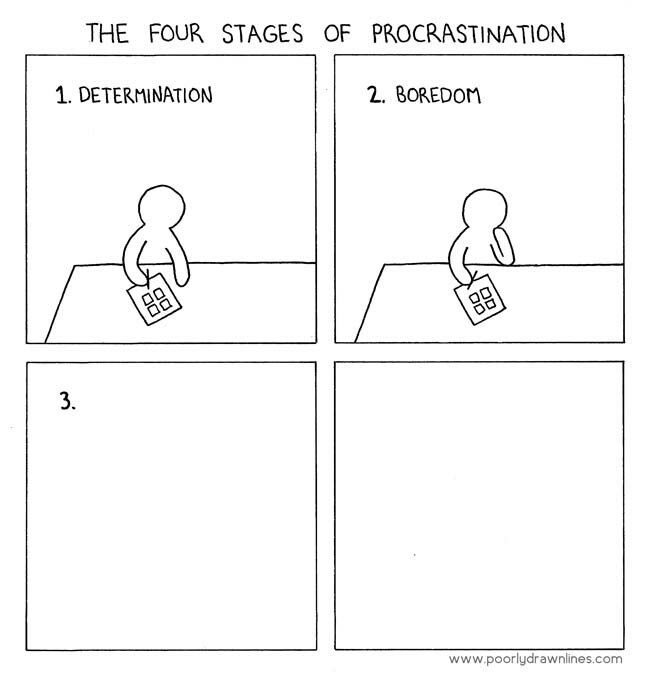 Thus, this guide is my tribute to the phenomenon that is procrastination, the retarded arch nemesis of productivity. Procrastination is defined by the Macquarie Pocket Dictaurus (It was the closest non-electronic reference near my laptop) as: ‘to defer action, be slow off the mark, delay’ and so on; in my opinion ‘to defer action’ provides the most accurate description. In order to be an effective procrastinator, you must seek out a way to defer whatever it is that you need to do. The list of possible alternative actions is endless but at its very core, an effective method of procrastination should essentially justify a deferral of the primary action by replacing it with a far more important action. The difficulty lies in the justification. 1. Time: This involves deferring the primary action due to your own judgement that there is ample time to complete the primary action later, allowing you to defer it. E.g. My exam is on Tuesday, today is Sunday, and if I go to the movies today, then I have all of tomorrow to study. This can also be extended by promising yourself to wake up 1-2 hours early or by dramatically re-adjusting your estimates of how much work you need to get done. 2. Reward: I will undertake this action as a reward for my hard work. This is commonly known as a break, a bite to eat or a quick chat online. 3. Environment: This is activated by the thought that if your environment is tidy or if you are in a more work-friendly surrounding you will be able to focus more on the primary action. Conclusion: So there you have it. Procrastination may instil feelings of guilt, however, by realising the nature of procrastination we are able to minimise it in a pro-active manner. Ultimately it is ourselves who choose to defer that all important primary action, whatever it may be. I hope you enjoyed reading this as much as I enjoyed writing it, i would like to thank Susie for editing this for me at 4am in the morning, she made me write that.